R packages contain a variety of resources including R code, native (C/C++/Fortran) code, datasets, documentation, as well as other supporting files. 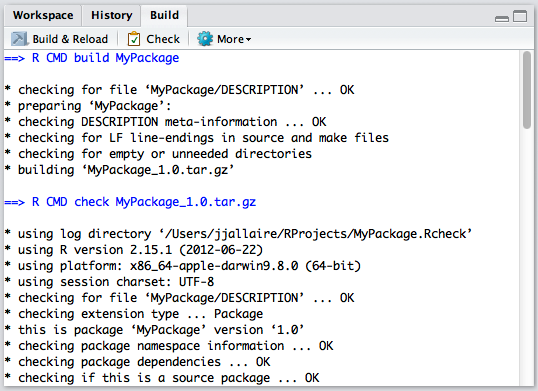 The usual workflow for package development is to make some changes, build and install the package, unload and reload the package (often in a new R session), then test as necessary. For most packages this occurs in only a couple of seconds and preserves all of your R session and RStudio IDE state. You can also execute Build and Reload using a keyboard shortcut (Ctrl+Shift+B) as well as configure RStudio to automatically save open source files prior to rebuiling. You can customize these options using Project Options : Build Tools. For more documentation on availble options see the article on Customizing Package Build Options. You can customize these options for building source and binary packages using Project Options : Build Tools. For more documentation on availble options see the article on Customizing Package Build Options. The devtools package includes a variety of tools aimed at making package development more productive. RStudio's package development tools integrate seamlessly with the devtools load_all and dev_mode facilities. The dev_tools::load_all function simulates installing and reloading your package, by loading R code in R/, compiled shared objects in src/ and data files in data/. During development you usually want to access all functions so load_all ignores the package NAMESPACE. It works efficiently by only reloading files that have changed. It's not 100% correct, but it's very fast. The RStudio Load All command (keyboard shortcut: Ctrl+Shift+L) calls the devtools load_all function for the current package. The devtools::dev_mode function switches your version of R into "development mode". 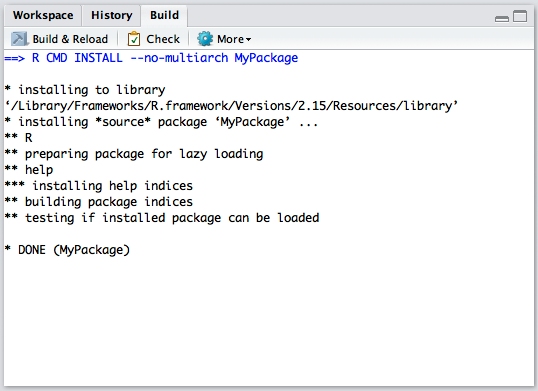 In this mode, R will install packages to ~/R-dev. This is useful to avoid clobbering the existing versions of CRAN packages that you need for other tasks. Calling dev_mode() again will turn development mode off, and return you to your default library setup. All of the RStudio package build tools are dev_mode aware, and dev_mode state is automatically preserved across restarts of R within RStudio. The "Comprehensive R Archive Network: (CRAN) is a collection of sites which carry identical material, consisting of the R distribution(s), the contributed extensions, documentation for R, and binaries. Contributing a package to CRAN allows you to easily share your work with the entire R community. Additional information on submitting packages to CRAN can be found in the CRAN Repository Policy document. The devtools package also includes the install_gitorious, install_bitbucket, and install_url functions for installing packages from other locations. If you work in an organization that builds R packages with intellectual property, you may not want to share your packages on CRAN, R-Forge, or on a public Github repos. Instead, you may want to control who has access to your in-house R packages. There are many ways to share packages internally. Consider some of these options. File shares. Save the R package source code or binaries in a common directory. Users can install these packages with Tools > Install Packages... in the IDE or with install.packages from the command line. System Library. If using RStudio Server, give your R package source code or binaries to your system administrator. The Sys admin can install those packages into the system library so that everyone has access. Local Repository. Create a local repository that contains your inhouse packages. Use install.packages to pull your package from this local repos.